Worlds Best SAVED MY HORSES LIFE ! This Clydesdale cross was purchased by new owners and after some 6 weeks it was found to be lame and then the hoof blew away leaving the heavy horse with little or no hoof. The Owner* having heard of Worlds Best Hoof Oil thought she would try the product and after bathing the hoof and killing all bacteria and fungus she began her dressings of Worlds Best and the hoof began to re grow Strong new Healthy growth and the horse is now past any danger of being put down and it is only some weeks away from having a hoof as sound as ever. The Vet has now said I have never seen such results ! 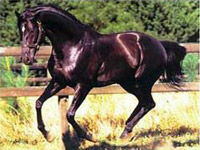 These pictures show an unshod thoroughbred mare that at the age of 5 years left the racing stables and began breeding. 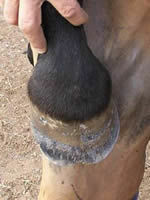 Once the shoes were removed the cracks started to appear and remained with the mare for over 4 years going from the base of the hoof all the way to the top of the hoof /coronet band. 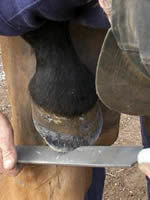 The farrier would trim and the hoof only to have them return as bad by the next trimming. The owners began using Worlds Best Hoof Oil and after only 6 weeks the cracks had gone and some 3 years and droughts and poor weather conditions the cracks have never returned with the owner using Worlds Best only 2 times a week. 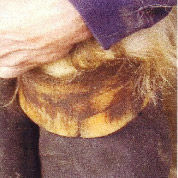 These photos show the new strong healthy growth using Worlds Best Hoof Oil only 2 times a week. Both of these horses come from separate professional stables and are trimmed/shod every 6 weeks. The pictures clearly show the old nail holes and the new healthy growth over that period. Worlds Best Hoof Oil will help maintain hooves in better shape and condition throughout all seasons and in most cases you will no longer have grass/sand/stress splits with the use of Worlds Best Hoof Oil. 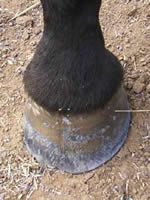 Use Worlds Best Hoof Oil for general maintenance and you will find a vast improvement in your horses hooves and those small line cracks such as Sand; or Grass will disappear and you will have less problems with White line/Seedy toe as the Bacteria/Fungus will not find it as easy to get into your horses hoof and create such problems from those cracks. Worlds Best Hoof Oil is so pure it goes in straight away and helps balance the horses natural moisture levels this fights climate change and conditions that are causing the drying out of the hoof. Worlds Best Hoof Oil works on all Keratin grow or for Zoological animals see Worlds Best Hoof Oil Hoof Horn Zoological dressing. I keep telling anyone who will listen about Worlds Best Hoof Oil because the product is FANTASTIC! The mare was left to fend for herself and without regular feeding. In a space of 6 weeks this mare who had severe splits and abcess's was returned to good health in the feet with the use of Worlds Best Hoof Oil.
" I had tried EVERYTHING & Every Product "
"Hello Worlds Best Hoof Oil, Just to let you know how pleased I am with your product, I have a horse who has survived a serious attack of laminitis . The damage done to the structures in his feet and hoof wall was bad and as the damage grew out the hoof wall was very weak, brittle and it was basically disintegrating. As you can imagine I have tried all the hoof supplements, the numerous dressings I bought were no use at all, the hoof stayed dry and brittle. I have been using your product 3 times a day and the difference is remarkable . The foot is now holding together, it's not drying out, which means the nails and shoes are staying firm. Thanks for in this case a LIFE SAVING PRODUCT as you know this dreadful disease my horse was balancing on the edge and with the help of your product, I believe I have saved him from death and have him for more years to come. Many Thanks!" "My horse Fearless Sophie is a 6 year old mare and she has won a lot of races but never has she been able to even place on a hard racing track. I was told about your hoof oil by the vet as he suggested as the mare was getting older I should try this preparation to give her every chance as the drought had made the ground everywhere so hard and as it will possibly be her last and I should use your product. 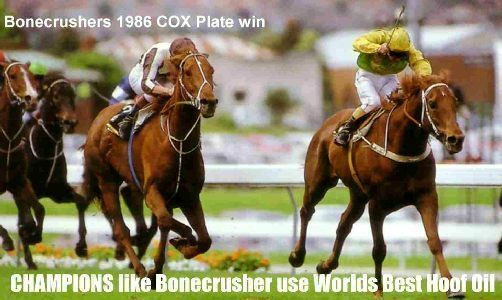 This preparation sho WON the Horsham Gold Cup on a flint/rock hard track and then she was 3rd in the Listed/Black Type Bendigo Cup again on a rock hard track and never jarred up at any stage. The only thing I have changed is the use of your oil! I have for years used all the other oils and greases and even boitin and didnt think your oil would be any different to all the others so I was a bit of a doubting thomas on your claims but your product is a winner. I will never use anything else, it does all it claims and more." "My horses are always accustomed to hard foot work and it is part of every weekend that some damage is done to at least one or two hooves as part of the ride in some pretty harsh ground up this way. 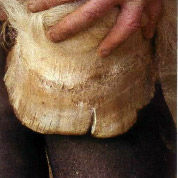 I have been using Worlds Best Hoof Oil for only 4 months and my only wish is that I had found your product years ago. Since I started to use it my horses are better shod and sounder of the foot and I have not finished out of the top 3 positions since I began using it. You have a top ozzie product here and I am sure the world awaits you." After talking with Bruce at length, it became obvious that the reason The Worlds Best Hoof Oil works so well is because of the ingredients. The oils, primarily Eucalyptus and Emu, are of the highest purity possible. The silicone is ÔÇ£AÔÇØ class so that instead of coating the hoof, as it spreads it forma a mesh pattern so the hoof can breathe as well as be protected. The sockholm tar pure is a virgin Swedish wood tar that has no petrochemical properties and none of the carcinogenic or harmful components that are in most wood or pine tars. This oil permeates the hoof wall. Therefore, it is used only once or twice a week, instead of everyday. Bruce is so positive that his oil is the best and will show results very quickly, that he offers a money back guarantee on every container." 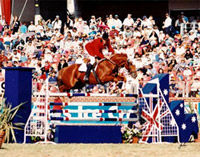 In December 2005, Mrs Lynn Clinkard, Master of CMV Beagles, Hampshire, was at her ÔÇ£witÔÇÖs endÔÇØ with her 8 year old, Thoroughbred gelding,ex-racehorse, Muffin Man. Lynn and her farrier had spent the last year battling with a deep and persistent sand crack which ran all the way up to the coronet band. Lynn (who has owned horses for 30 years) thought she had tried everything and yet still failed to overcome the problem. At this point Lynn was given a sample of Worlds Best Hoof Oil and with nothing to lose, decided to give it a try. After using the oil for only 3 weeks she was delighted to see a clear improvement. In my experience, the daily use of the Worlds Best HOOF Oil promotes up to 30% faster, healthier and stronger hooves than any other product I have seen in my working life. The results speak for themselves. If you have a hoof problem with any horse from the racetrack, mountain country or even the family pony, then I would recommend this product. "I have never seen the same results from any hoof product in my lifetime that I have seen with the Worlds Best Hoof Oil. This oil promotes quickly, a strong and workable hoof, if you've got the horse, this will give your horse the foot. I use and fully recommend it." 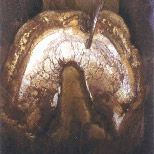 "After receiving my sample of Worlds Best Hoof Oil from the coupon in Horse Deals I write to thank you for the sample. I am a total convert and have purchased a bottle last week. I ride my horse 6 days per week and totally believe in good nutrition and hoof care, the very foundation of good horse management. I had seen your oil in my local fodder store and was worried about if it was just going to be yet another one of those products that promises so much and delivers so little so with the high price of feed, I therefore hesitated to purchase it. BIG MISTAKE! From the 1st application my horses' feet looked better and seemed instantly "hydrated" No more mucky grease as I had been using. The results from your sample of the Worlds Best Hoof Oil are really outstanding and I am thrilled, the whole foot is so healthy (frog and sole included) and they look GREAT! Your product not only WORKS but is also so ECONOMICAL!" "This is GREAT STUFF! My horses train and race on some very hard surfaces and I have always oiled their feet. When I switched to the Worlds Best Hoof Oil I found it so easy to apply even on early cold mornings and noticed within 2 weeks the promotion of healthy new growth. I have never seen such growth in such a short period from any other product. Your product has won me for life." "I operate a small but successful business where my horses are the lifeblood of my income. I have always maintained a strict regimented plan for the health and well being of my horses that includes feeding them well and looking after the feet. I thank you for your outstanding product. I simply can not believe the results from all my horses and all in less than a month after I began using it. My horses go over rocky ground and also walk in the shallows of the river so the going is demanding. It takes me less than 2 mins to do each horse and without question my horses are more comfortable & happy". 13 Year Old - N.S.W. ÔÇ£My Dad has always made me oil my pony Flint with oil he got from his dad but Flint has always had some sort of problem and Dad said he thought it was his breeding. Dad got me some of your oil from the farrier and it has fixed the cracks and pieces breaking and the farrier says we have got the answer to his problem and itÔÇÖs because of your oil. Flint, Me and Dad thank you for your oil." "Educating horses means hard work for them on dirt, sand and turf and lots of stress on the legs and hoof. Worlds Best Hoof Oil gives the best results in keeping the hoof sound, strong and yet flexible to cope with everydayÔÇÖs hard yard. I believe the horses are more comfortable since I started using the product & helps reduce concussion"
ÔÇ£ I recommend to all our clients to use Worlds Best Hoof Oil as the results are simply outstanding and nothing like I have seen before. I use it on all the older Weanlings, Yearlings and Broodmares and naturally on Wild Harmony. The name says it all, Worlds Best Hoof Oil"
Fabulous is the answer to that. IÔÇÖve been using your oil now for over six months and am so very impressed with the results. My new horse had fairly bad feet and with the stress of moving to a new home they were literally crumbling away before my very eyes. After only a couple of months of using my oil they improved dramatically and now are absolutely perfect and I have no trouble keeping shoes on at all. In fact my farrier was here today and he also commented on how good his feet were now. He also mentioned that so many horses feet are so dry at the moment with our very dry weather, yet my horses are all in lovely condition with the regular oiling I do. Also I love the handy travel pack and brush ÔÇô one in the tack shed and one in the truck, perfect! Thanks so much for all your help and advice. 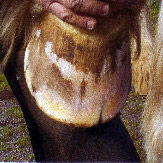 I have been using the WorldÔÇÖs best hoof oil this summer. I have found the horses hooves to be healthy and not becoming dry and brittle, even during these rock hard days of summer. My farrier has noticed a definite improvement in the strength of the wall as well. I would recommend the oil to anyone serious about keeping their horse sound and feet healthy. New Zealand Testimonials: How good is WBHO!!! I have a Cleveland Bay X who has had a problem with broken and chipped feet, for a couple of years now, and I have tried all sorts of products both on his feet and in his feed. Unfortunately, there has been little improvement until I started using your hoof oil. After applying WBHO for a couple of weeks the chipping has totally shopped. A further month down the track his feet have a really healthy shoe and he now has all but grown out the broken area, and has plenty of strong hoof to nail to. I will always have WBHO in my tack box. Just a quickie email to let you know how impressed I am over this hoof oil! I have some photos too which I will forward to u when I can. I spoke to you on the phone and ordered some oil about 6 weeks ago. My thoroughbred boy who has the most dreadful feet and is very prone to seedy toe has never had his feet looking so good... even my farrier couldn't believe the change in 3 weeks! Even his soles have hardened up! Thank you so much.. I will be ordering some more soon. MY HORSES FEET ARE LOVING IT!! You sent me a sample and IÔÇÖve almost used it all. ItÔÇÖs been the ONLY product I have found work on my horses badly cracked club hoof. I am only new to using WBHO but think itÔÇÖs great!!!! Wow, your hoof paint is fantastic. Daughter has started using it on a TB of ours who has dreadful feet and has been really impressed with how it is looking. My horse Flip had a nice big crack running down the centre of his hoof. I forgot to take a photo at the beginning...5 days later I noticed that the crack was knitting together! So too late for a photo!! It will be interesting to see what the farrier says next time he trims Flip's feet up. Thanks for giving us WBHO, Dougals feet are looking GREAT and just had the farrier back after 4 weeks as his toes had grown so much. Have a great Christmas & Happy Riding. I received this email from Charlotte Porter she knows I use this product a lot and absolutely swear by it, if there is any chance of some sample lots to give to my clients that would be fabulous. At the moment after every trim and shoeing I do, I currently use my own supply and at this rate I am going through it like wild fire, it has to be the most amazing stuff I have every used. My boys feet are proof in itself, they were in a very bad way when I bought him 4 months ago, just long cracked and unkempt, I have been feeding various supplements (incl Hoof Grow Plus very good stuff), but that really didnÔÇÖt make that much difference until started using WBHO. Within a week I noticed they were much moister and then after four weeks I now have got 5mm of growth uncracked from the coronet band and also the bottom of the hoof the cracks are now very minute ( he traditionally grows very slowly, less then ┬╝ inch after 6 wks). Honestly its the most amazing stuff I have ever used and I was very skeptic about it when I first started using it, now IÔÇÖm sold for life. I have only been using The Worlds Best Hoof oil for a relatively short time, but in this time I have been very happy with the results, especially one horse in particular that had hardly any hoof to nail a shoe on to after he ripped some hoof clean off. The damage is now repairing quite well with the help of The Worlds Best Hoof Oil. Over all I have found this product to be very good and I will continue to use it on all of my team. I own a very special horse (as they all are, I know) his name is Dundee and he has hunted, adult ride, horse trialed, trekked done a little showjumping and showhunter, I suppose a bit of most things. He is perfect and has looked after me well except his feet were dreadful. He has three white socks and was always losing shoes (no matter what blacksmith I used). The old shoe holes always became brittle and the sides seem to always break and delaminate. They never grew fast enough so when it was time to shoe again the blacksmith had to nail into pretty crummy feet. I tried everything recommended by vets, blacksmiths and saddlery shops. Many of the products were pretty expensive and I had to hide the bills (if you know what I mean) there was never any difference to his feet and I was pretty religious in the applications. I was in Melbourne at equitana (a huge horse expo) and noticed a stand with worlds best hoof oil with pretty impressive photos and testimonials. I was very suspicious as I had had so many disappointments and really questioned the poor aussie. Anyway I ended up buying 4 litres and bringing it home. Well all I can say is my blacksmith and I have all noticed a huge difference in Dundees feet and they are now easily able to hold shoes for 6 weeks and they look normal. I decided to purchase more and discovered that there was no NZ distributor. So I decided that I would try and make a difference to kiwi horses feet. I wasnÔÇÖt happy in the knowledge that aussie horses had this fantastic product and we didnÔÇÖt. In the well known words of Uncle Les (the uncle of Peter Toogood the original founder of wbho) way back in 1898 who said ÔÇ£NO HOOF NO HORSE ÔÇ£ he also went on to say ÔÇ£If the horse is bad in the hoof he will begin to compensate in other areas of his body and become sore throughout the shoulder, the neck and spine and the sciaticaÔÇÖs. My aim is to make a difference to all new Zealand horses feet. 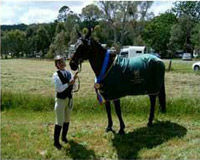 "I'lI have been using Worlds Best Hoof Oil with my managed horses here in New Zealand for several months now. In that time I have noticed a considerable difference in the condition and soundness of their hooves. I was so impressed with Worlds Best Hoof Oil that I have now had it exported to my main clients in Macau and they are getting similar results.I would recommend that anyone give it a try as you wont be disappointed as it does what it says it will do." " I have too many excellent stories for one single testimony but a couple spring to mind, At a station I went to shoe a team of 14 horses. Upon arrival I was unable to put shoes on any due to cracks and splits. I introduce them to Worlds Best and within 14 weeks was able to shoe the ALL..........................another..........A dressage client had a horse sevely effected with Laminitis with a rotating pedal bone. Within 6 weeks there was a massive difference. Her horse is SOUND TODAY and this is only attributed to Worlds Best Hoof Oil ( and correctional trimming).............another...........A horse had major splits from Selenium poisoning on all 4 hooves. Within 13 weeks there was 1 1/2" of Healthy Hoof growing from the coronet band......................and yet another...........................a 30 year old had Major Sand Splits. These are now virtually invisible after 9 months. 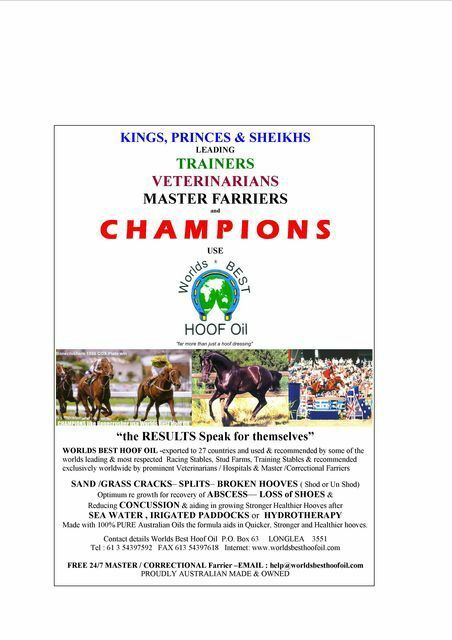 All these cases Worlds Best Hoof Oil is the ONLY product used and I believe the incrediable improvments are directly because of Worlds Best Hoof Oil. I hot shoe all the time,and those that use Worlds Best reguarly there is no broken hoof,good growth and the shoes stay on.The nail holes virtually close over and I have noticed the horses have not jarred up......................."